This project lowers the security substantially on your computer. 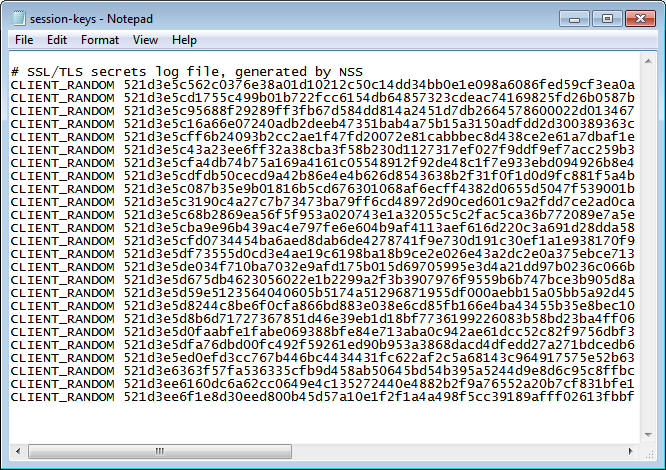 Encryption keys will be logged in plaintext where Wireshark can find them. This is something useful to do for testing, but you shouldn't use a computer with this modification for anything personal like shopping. That's why you need to make a restore point before starting this project and restore it settings when you are done. Click Start. Type in CREATE. Click "Create a restore point". 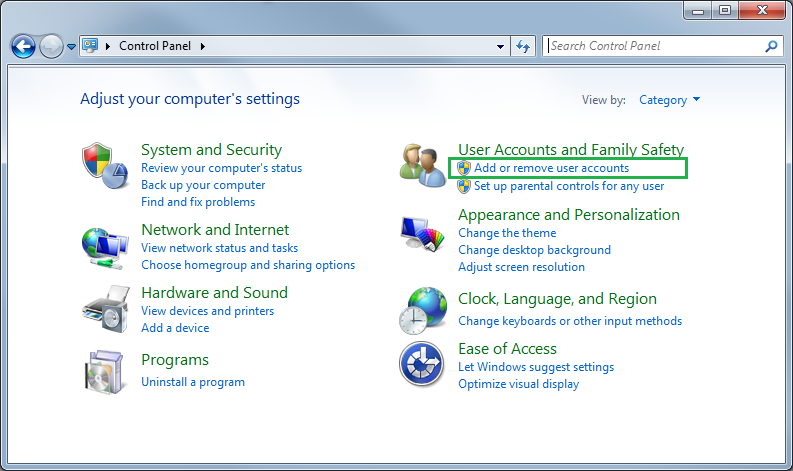 In the "Restore system files and settings" box, click Next. In the "System Properties" box, click the Create button. 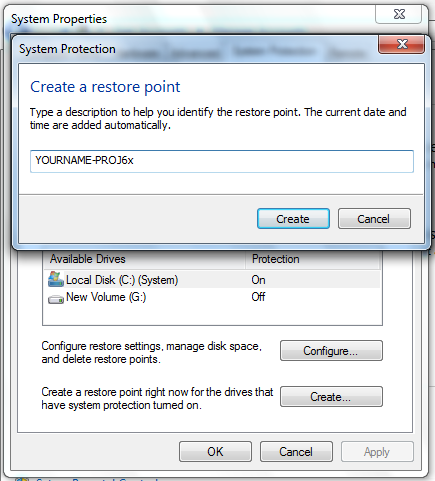 In the "Create a restore point" box, type a name of "YOURNAME-PROJ6x", as shown below. 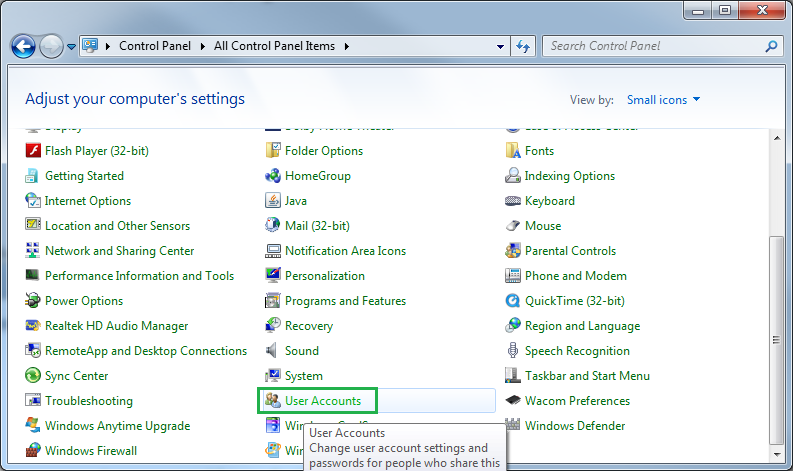 If your Control Panel is in Category view, click on "Add or remove user accounts"
…followed by "Manage another account". 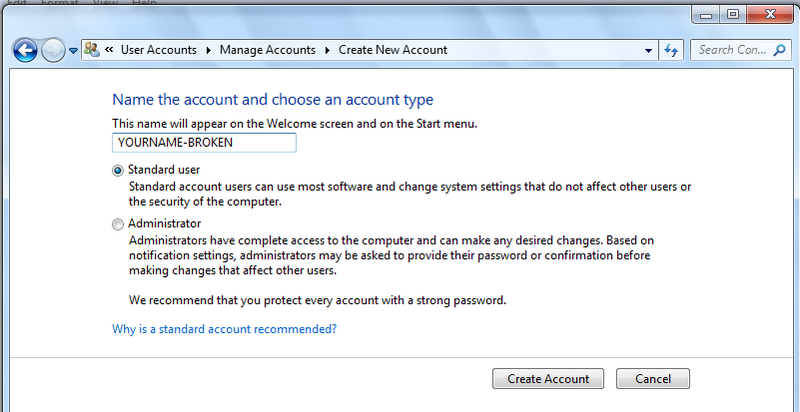 Give this new user account a name of YOURNAME-BROKEN, as shown below. 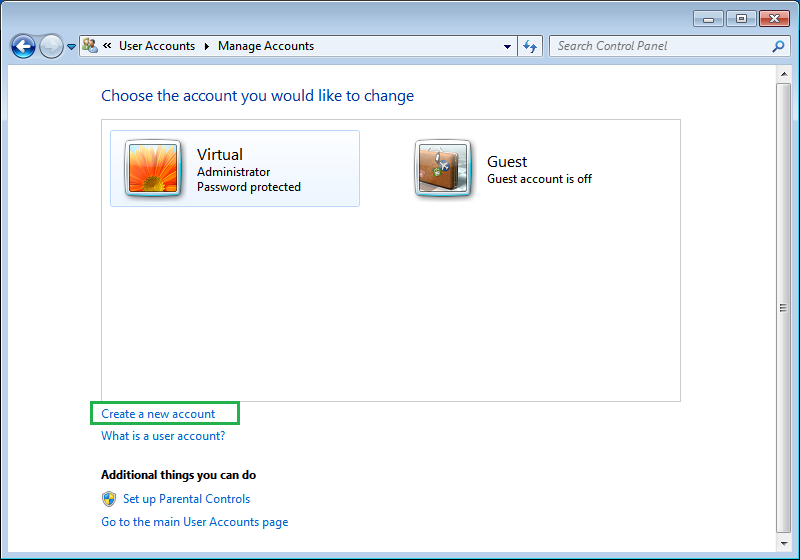 Make sure you make this account a Standard user, NOT an Administrator. Once this is done, you will need to restart your Windows 7 computer to continue. You will not need to log into your Unprivileged account just yet. Restart your computer again. This time, log into your Unprivileged user account which you will be using for the rest of the Project. 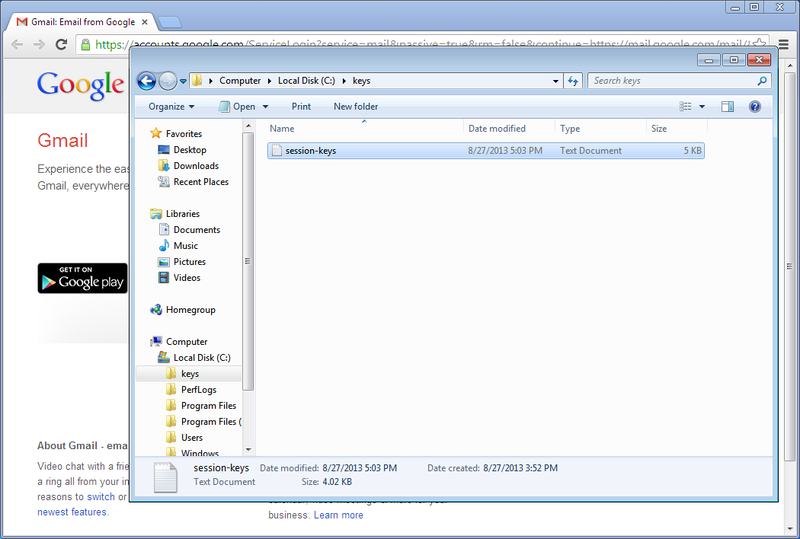 In Chrome, go to YAHOO.COM, then click "Email"
Left-click on the padlock icon on the left side of the address bar, then left-click "Connection". 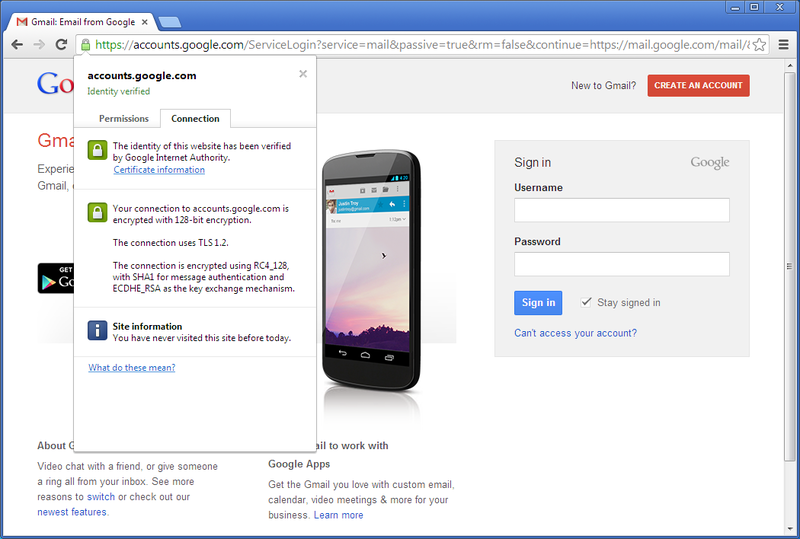 Notice the message saying "The connection uses TLS 1.0". When Yahoo upgrades to TLS 1.2, the way AOL did, this project will stop working. 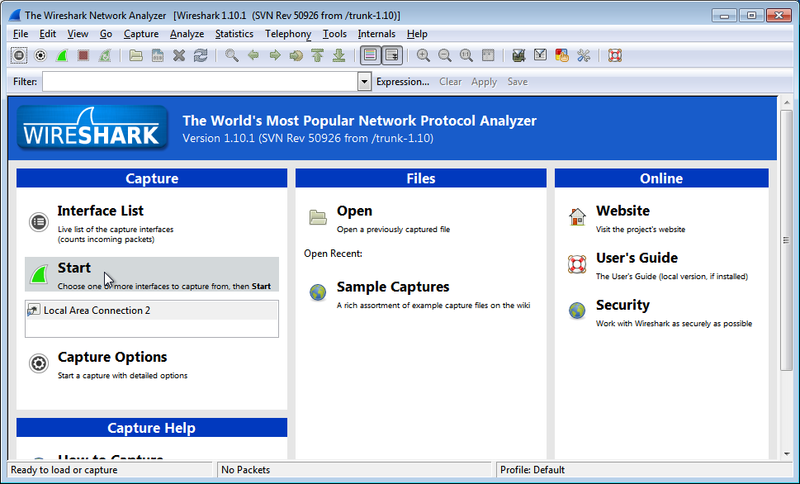 Open Wireshark. In the menu bar, go to Edit › Preferences. In the Preferences window, expand "Protocls" in the left side and scroll down to SSL. 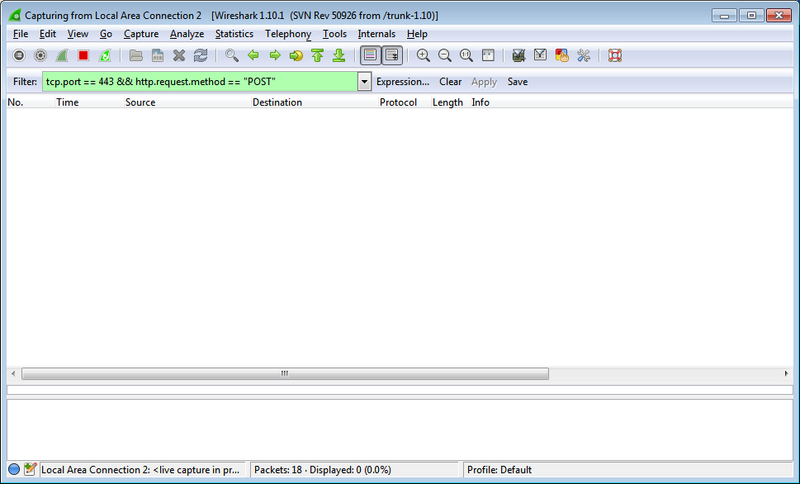 Type tcp.port == 443 && http.request.method == "POST" in the Filter textbox, then click "Apply". The password will be rejected. Go back to Wireshark. There should be a single packet listed for the active filter. 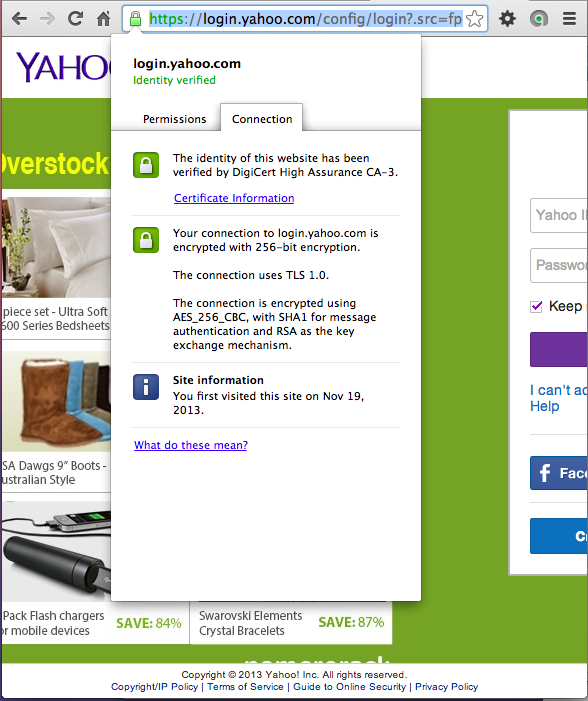 At the bottom, click on the tab labeled "Decrypted SSL Data"
Take a screenshot showing the username and password you supplied to YAHOO.com to turn in for credit for this assignment. 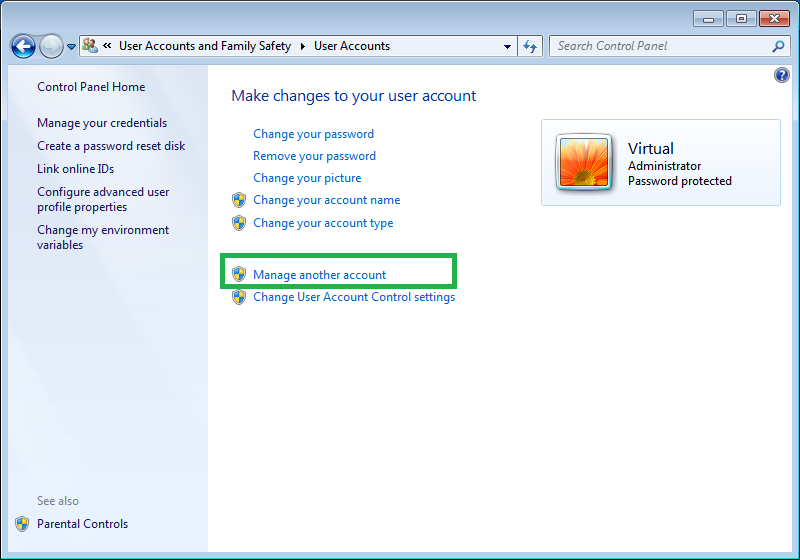 Make sure you can see password containing your name, as shown above. On your keyboard, press the PrntScrn key. 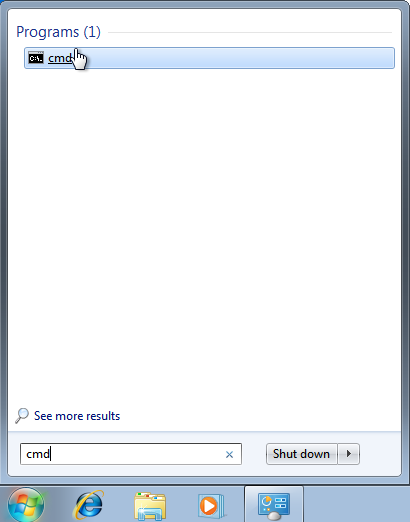 Click Start, type in PAINT, and open Paint. Press Ctrl+V to paste in the image of your desktop. YOU MUST SUBMIT WHOLE-DESKTOP IMAGES TO GET FULL CREDIT. Save the image with a filename of "Proj 6xa from YOUR NAME". 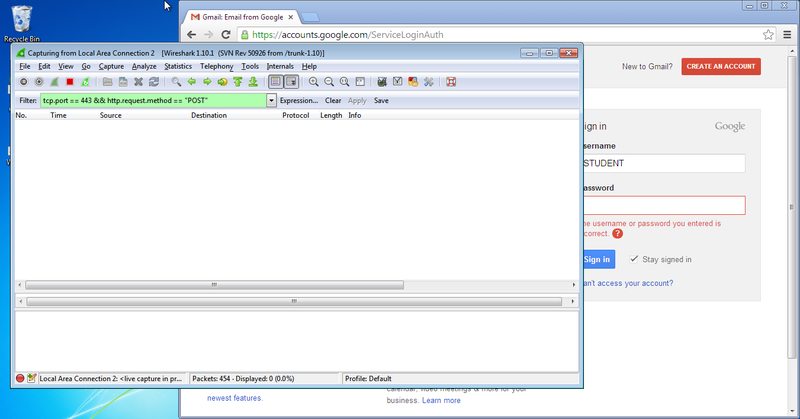 Let's take a look at the Connection settings for Gmail. "Oh no, what went wrong?" Don't panic, this is the expected outcome. 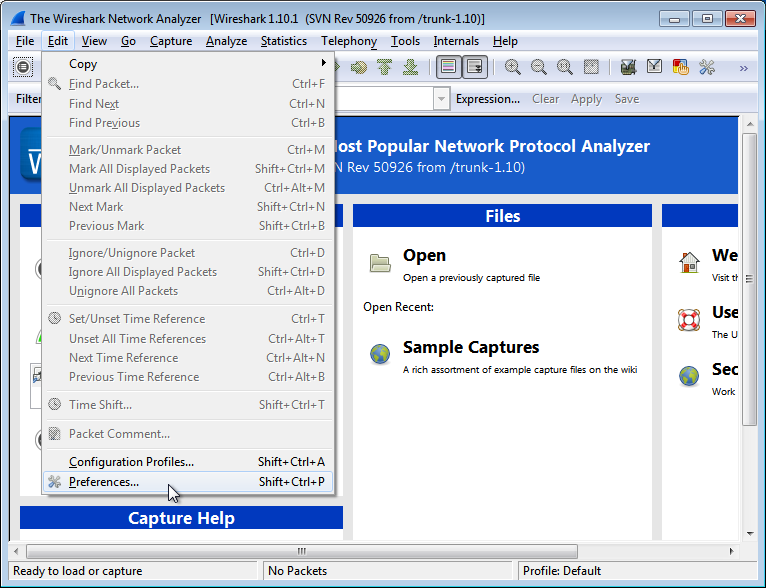 If you read through the captured packets, you will find that all of our network traffic is still encrypted (which means, you cannot locate your username and password). 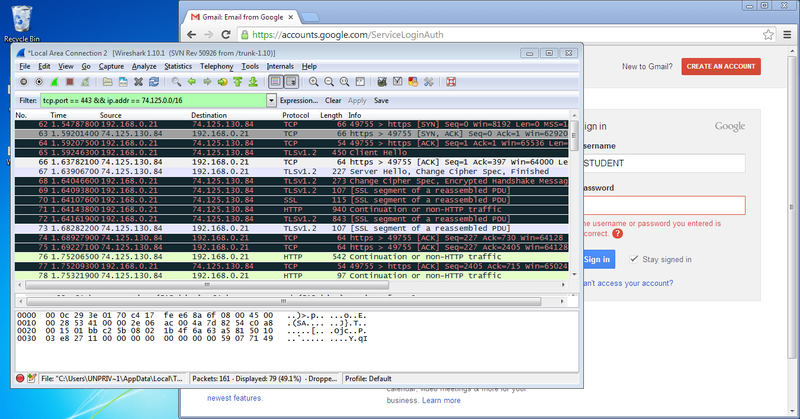 You may be wondering, why was YAHOO readable when Gmail isn't readable? The difference is that YAHOO used RSA as its key exchange mechanism, while Gmail used something called ECDHE in addition to RSA. With plain RSA, your browser uses the server's public RSA key to decide on a shared key for encrypting and decrypting messages. Thus, if somebody had the server's RSA private key, they would be able to read any previously captured SSL traffic. 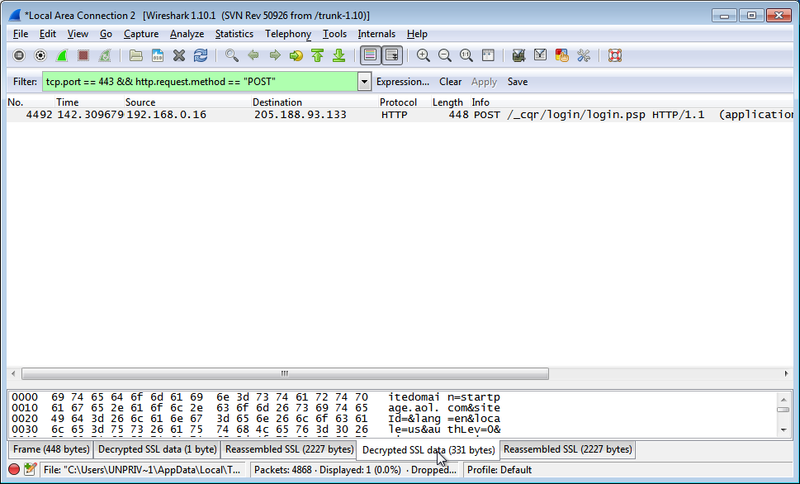 Since Wireshark has your client-side private key, we are able to read our own AOL passwords, but nobody else's. When ECDHE and RSA are used together, the server generates a random (and hopefully unpredictable) private key for your packets, and signs that key with their RSA key. It then sends you the public key that corresponds to the private key it just generated. As a result, your encryption/decryption key is not determined by the public RSA key of the webserver. Each user has a different session key (they are not reused for multiple users) and the keys are destroyed after each session. Thus, if somebody had the server's RSA private key, they would not be able to read previously captured SSL traffic if ECDHE_RSA is used. This property (not being able to intercept past communications with a copy of one party's private key) is called forward secrecy. Click Start. Type in RESTORE. Click "Restore your computer to an earlier time". In the "Restore this computer to an earlier point in time" box, click "Open System Restore". In the "Restore your computer to the state it was in before the selected event" box, click Next. In the "Confirm your restore point" box, click Finish. In the "Once started, System Restore cannot be interrupted. Do you want to to continue?" box, click Yes. You should see a message saying "System restore completed successfully", as shown below. Save the image with a filename of "Proj 6xb from YOUR NAME". Email the image to: cnit.120@gmail.com with a subject line of Proj 6x From Your Name, replacing Your Name with your own first and last name. Send a Cc to yourself.